Breaking the Guinness World Record! Last week I went to LA with the Kids for Peace Great Kindness Challenge team to help break the Guinness World Record for the largest handprint collage. During last year’s Great Kindness Challenge, over 140,000 kids submitted handprints beautifully decorated with messages of peace and kindness. Before I found these wonderful people, I spent so much time agonizing over how unkind and unfair our society was, but I didn’t DO much about it. Writing kids’ books to address injustices was my first step, but I wanted to do something more. These people put kindness in motion. They are such an inspiration. They have helped me convert my frustration into action. So many people pulled together to break this record, and it was truly heartwarming to see. Tons of kids from nearby schools came to help. Starbucks sent coffee and team members. Kind Snacks sent team members and kind bars. 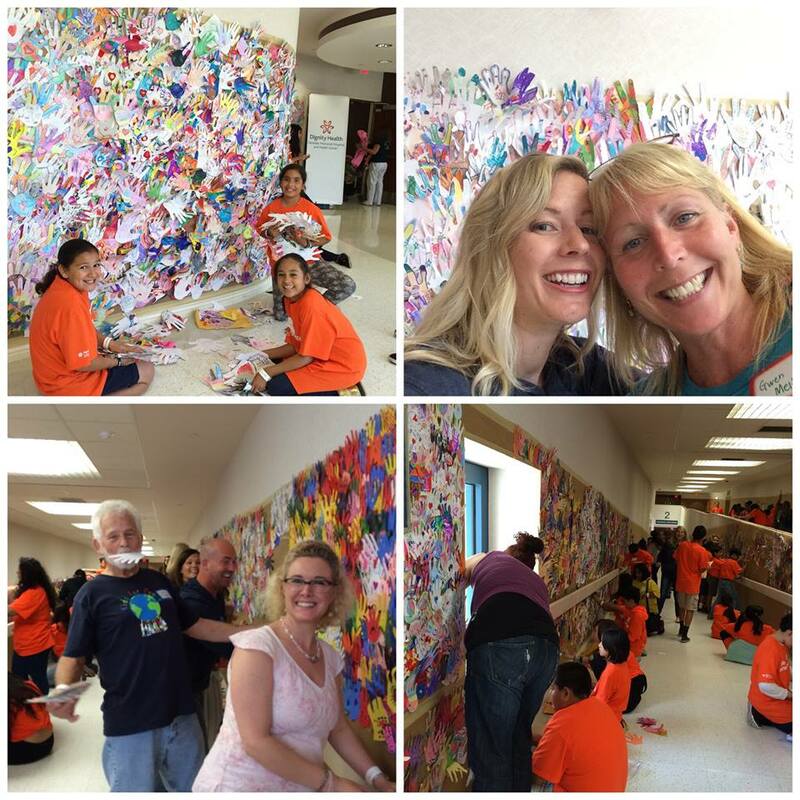 Dignity Health was kind enough to open up their Heart Center for the collage, and many of their team members helped hang up hands. Kids for Peace volunteers worked tirelessly. It was such a beautiful display of everything the Great Kindness Challenge stands for. With such a huge mass of hands, every now and then I forgot that this whole thing started on an individual level. That each handprint was on a child’s desk at some point. And with their own little hands, individual kids colored and glittered and composed poetry or words of wisdom. As I was glue-sticking hundreds of hands to the walls, I would pause every now and then, and read their creations. The beauty overwhelmed me. In the end, over 104,000 handprints made it up on those walls. This definitely surpasses the previous record, and if all goes well, it will be official sometime in the next few weeks. But regardless of how the judging goes, I think this community has made a powerful point: Kindness is an action, and if we all put kindness in motion together, we can accomplish anything. This entry was posted in Uncategorized and tagged activism, chapter books; super lexi, dignity health, emma lesko author, great kindness challenge, guinness world record, Kids for Peace, kind snacks, starbucks on June 18, 2015 by admin.